Camping Gear! Record Players & Guitars! 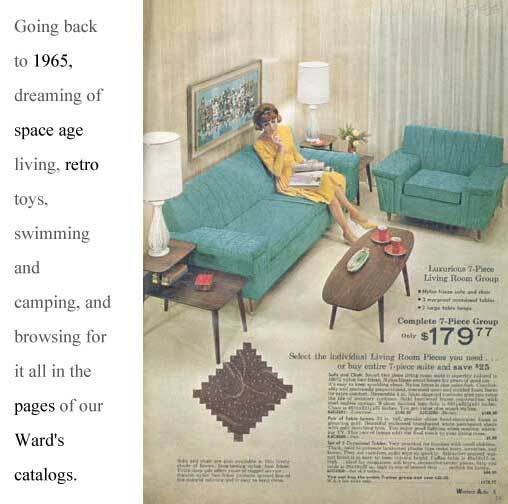 Going back to 1965, dreaming of space age living, retro toys, swimming and camping, and browsing for it all in the pages of our Ward's catalogs. 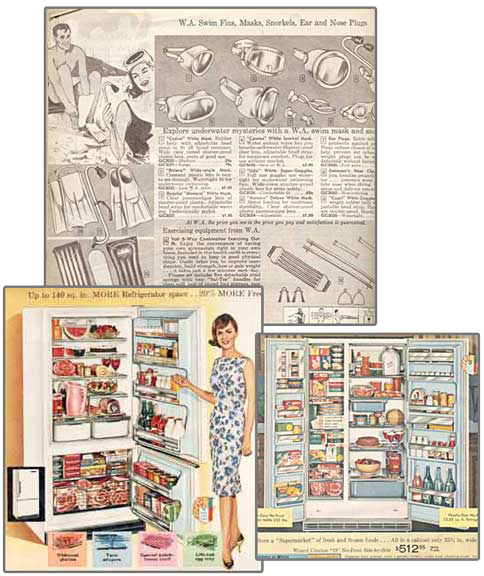 I loved the refrigerator ads with all the food loaded inside! Everything looked so much better than it did in the stores. The pics on this page are all scans from a 1965 catalog. It's great to go back and compare prices! One of the things that I used to love to do was browse the pages of the Ward's or Sears Catalogs. There was just so much to look at! There was a certain fascination, even looking at the things that normally should not have interested me at all, such as the living room or kitchen sets. I think it was just the fact that I could envision our house to be so new and shiny looking just like life on television. We Americans had such incredible style and taste back then. What I loved most about these catalogues was looking through them page-by-page (skipping all the girl stuff of course). It was fun to imagine how great everything would be if we just replaced our entire household with new stuff from the catalogues. Natually, there was nothing as great as Army Toys. These were the kind of toys that I used to stare at, and drool over for hours on end. I'd try to hatch get-rich-quick schemes on how to make enough money to buy them. There were so many cool "high-tech" army toys back then, and I wanted every one of them. Here are more army toy memories. When you were a kid in the 60's, there were few greater joys than checking out all the toys in the catalogs come Christmas time. There was just so much to look at, almost a nation of toys unto its own. I can recall train sets, models and accessories, guns, bikes, and more. More Christmas memories. Along with my love of army stuff, was my love of camping gear. The catalogs provided me hours of fantasizing about that perfect camp. I only wanted the small pup tents; those were the kind soldiers carried. I finally saved my allowance and bought an army surplus tent and set it up in the back yard. I built simulated a campfire with a circle of rocks and dandelion tops underneath branches. The dandelions were yellow and looked like fire! I remember when the first Stingrays came out. I didn't think anything was more cool than that! 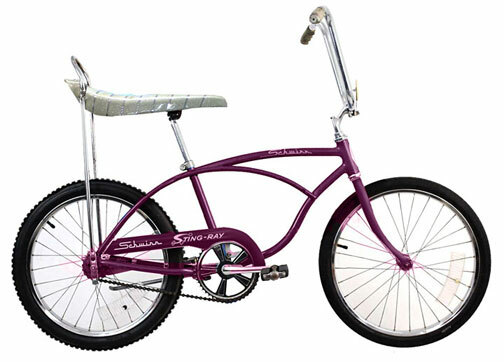 The purple Schwinn's were the hottest in my opinion. My brother Pat, being the tinkering whiz that he was, actually built me a Stingray for my birthday. It was purple, and very, very cool. He collected, and traded for, all the parts to make it. More Stingray memories here. I recall that I used to have a Ward's "Airline" record player that I had for years. That thing really had durability! It got packed from friend's house-to-friend's house and room-to-room. To me, it sounded just fine. I didn't even get my first stereo until I was sixteen. And speaking of music, who among us did not want want an electric guitar, or try to simulate one out of wood, or cardboard to pretend along with our favorite songs? (I often used a broom to fake my hot licks with). Who among us did not want to be a Beatle? A Herman's Hermit? 1 of Dave Clark's 5, or a Kink? How many of us had access to a guitar somewhere, and baffled friends and family with our acquired knowledge of how to play the opening riffs to a cool song? I know I sure did. My first riffs were: "You Can't Do That" by the Beatles, "You Really Got Me" by the Kinks, and "Satisfaction" by the Stones. My first chording, after seriously deciding to learn, were of two great classics: The Animals' "House of the Rising Sun" and The Rolling Stones' "Play With Fire". My first electric guitars were: a Victoria, a Lyle, and I eventually inherited a Fender Jazzmaster which my brother later stole from me. As Americans, how cool were we? I mean, we had all this great stuff. 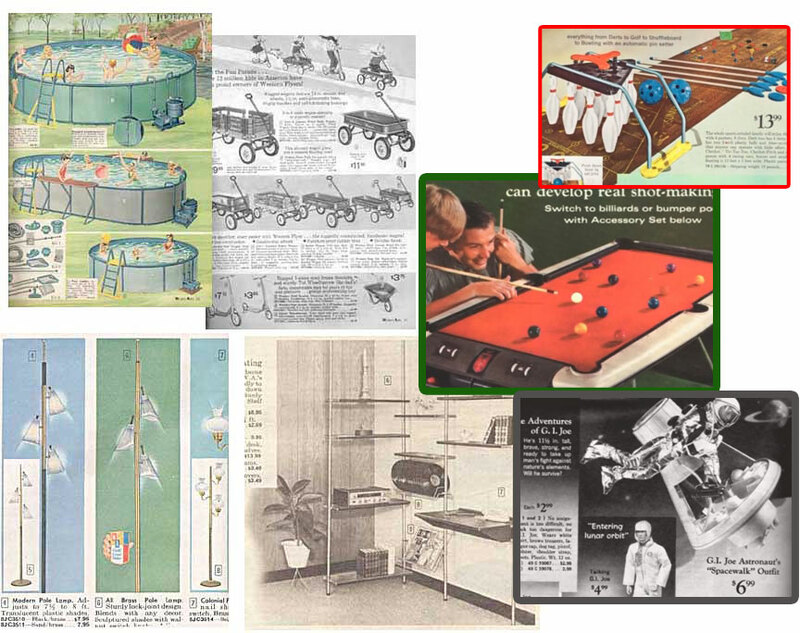 We had above ground pools, wagons, and space age furniture. I always thought our family had seriously stepped up in class when we started getting this newer furniture.